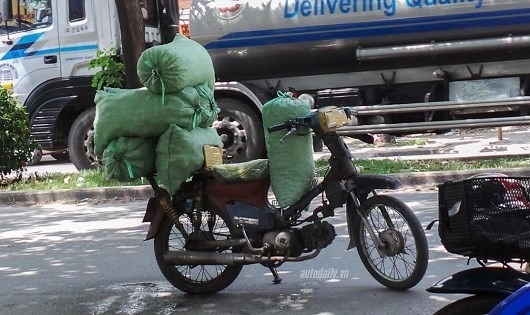 HÀ NỘI — Hà Nội’s People’s Committee has been considering measures to revoke about 2.5 million outdated motorbikes to reduce air pollution, which has risen to alarming levels in recent years. Nguyễn Đức Chung, chairman of the committee, said the city’s environment had been polluted for the past several years, and exhaust fumes from vehicles were listed as the prime reason for the same. The committee will consider allocating part of the city’s fund to implement the task of revoking the motorbikes, he said. There are 6 million motorbikes operating in Hà Nội, of which 2.5 million are outdated and unsafe for use, he said. The proposal has received support from experts. Nguyễn Hữu Trí, deputy head of Việt Nam Registration, said that among the 40 million motorbikes operating nation-wide, many have been operating since the 1980s or 1990s, giving rise to serious pollutants and posing traffic accident risks for both drivers and other road users. Outdated motorbikes, including automobiles, discharge higher volume of emissions than other vehicles. Most of the emissions are hydrocarbons, carbon dioxide, which adversely impact the human health, he added. Phạm Ngọc Đăng, Vice Chairman of Việt Nam Association for Conservation of Nature and Environment, said the composition of the emission depended on the quality of the engine. The older the engine, the lower its capacity to burn fuel efficiently. Toxic emissions from outdated vehicles were two to four times higher than those from the new ones, he said. Figures from the Road Safety Committee in 2015 showed that there was a correlation between the number of accidents and the average age of vehicles. Vehicles that are between one and five years old had fewer serious accidents than those that were between six and 10 years old. Revoking outdated vehicles was necessary, but it could not be carried out in a day, both Trí and Đăng said. Trí said there was no law to regulate the age limit of motorbikes and five-seater cars. Thus, it was necessary to set up legislation for the same, he said. This would help authorised agencies to deter and seize outdated vehicles, he said. Five-seater cars have to be registered regularly, so that they can be checked for quality, but there is no system in place to inspect motorbikes yet, he added. Experts, however, pointed out that outdated motorbikes mostly belonged to the low-income earners and could be their main means of transport, especially as the city’s public transport system is still inefficient. Revoking old motorbikes could affect the lives of many households, they said. They suggested that the city should allocate part of the fund to purchase outdated motorbikes or co-operate with motorbike enterprises to buy old vehicles, so that people are encouraged to exchange their outdated vehicles for new.